For those of you who don’t know me very well, my food lifestyle and this blog started because of a lifetime of dealing with Lyme Disease and her related minions. Since I was twelve I’ve had three serious flares of Lyme, which have resulted in severe joint and bone pain, muscle spasms, neurological waves of yuckiness (medical term) and scores of issues with food. But I am very fortunate. I have an incredible medical team, a supportive family, and health insurance through my family business (it’s practically impossible to get insurance outside of a business if you have a pre-existing condition). And the intimate experiences I’ve had with my body have shaped my lifestyle and approach to wellness and food. This week I could feel the weather changing in my bones. From a springy, energetic summer demeanor I’ve felt my body shifting into the Hunchback of Washington Heights. Today, for the first time in a while, I had to medicate, and know the coming cold will make this a more regular occurrence. But overall I still feel so far from where I’ve been before. And that is a result of listening to my body, seeking out excellent medical advice and constantly nourishing my body with the goodness of positive things around me. Enter this recipe. I’d noticed I’ve been craving meat lately, suggesting that I may be slipping back into anemia. The abundance of root vegetables and hearty leafy greens of the season is timed perfectly. As is the new batch of Indonesian cinnamon I just picked up. Along with the calming, inspiring affect I feel when working with food, a recipe like this provides so many nutrients to fortify us against the coming cold. And it’s just plain tasty. And not hard to make. Many newer cooks can be intimidated by lamb – I know I once was. 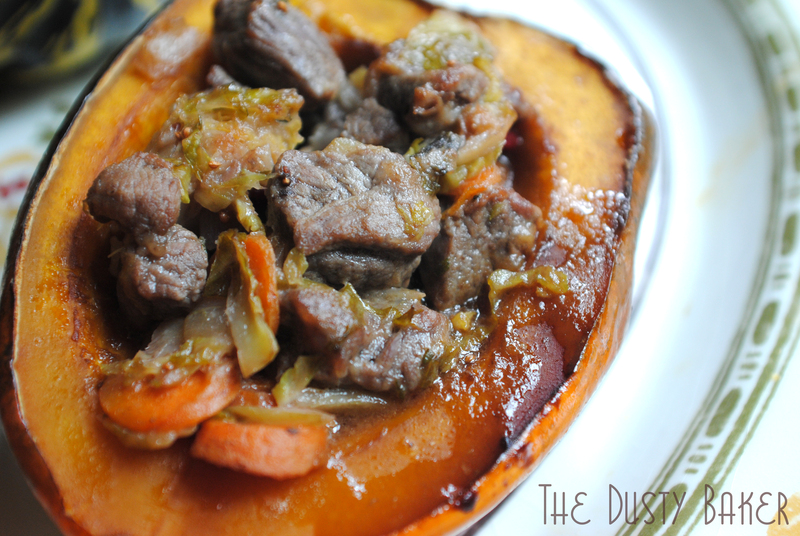 But it’s one of my favorite meats to cook, and so deliciously versatile. 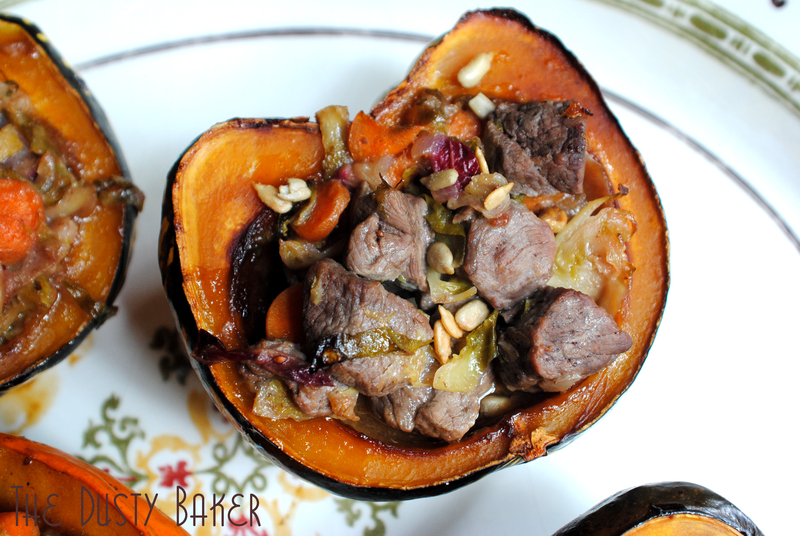 I find it takes the combo of sweet and savory that I so love better than pork or beef. And it’s packed with iron. Acorn squash is another of my favorite fall foods: along with simply roasting it, it’s the perfect nest for meaty and vegetarian dishes alike. A favorite filling is tempeh stir-fried with quinoa, carrots and dried fruit. Heck, even a Thanksgiving bread stuffing would taste divine. But this one combines lamb, onions, carrots, cranberries, Brussels sprouts and sunflower seeds for warm, filling and dynamic results. The recipe is endlessly adaptable. Grab what you have leftover in the fridge or pantry, and have a blast. Place squash in a deep baking pan skin down. Brush with molasses / maple syrup. Place in heated oven and bake for 30 minutes while prepping lamb. In a large skillet or cast iron pot, heat oil on low. Add onions and garlic and cook on low until golden and soft. Season lamb with salt and pepper and add to skillet, browning on all sides. Add rosemary and toss to coat. Into the hot skillet drop cranberries and cook for 1 minute. Add carrots, Brussels sprouts and cinnamon. Grate ginger over the mixture and stir to combine. Cook for about 8 minutes until the vegetables soften. Add vinegar and toss to coat. Turn off heat, return lamb to skillet and mix thoroughly to combine. Remove squash from oven, fill evenly with lamb mixture. Cover with tin foil. Return to oven and cook an additional 30 minutes or until lamb just starts to brown on top. Serve sprinkled with nuts and a drizzle of molasses and vinegar, if desired. Makes four hearty servings. Great as a main course with a salad or wilted greens on the side. Beautiful to present at a special dinner, too! I think this must be my ideal autumn dinner! 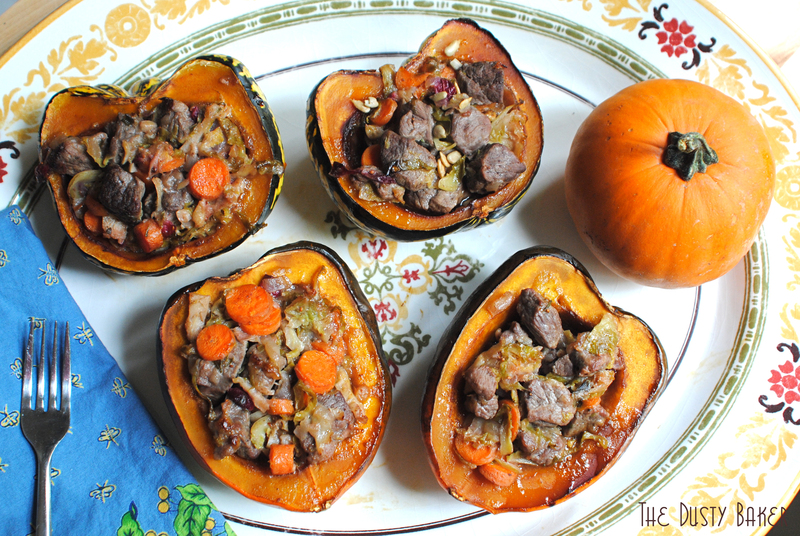 Lamb is my favourite meat and I’m totally in love with squash right now. Yet another great post, Dusty. These look adorable, full of flavour and love how your recipe can be adapted, too. I’m sure with a few doses of this, you’ll feel better. Look after yourself and fingers crossed that the yuckiness (love your expression that it’s medical – lol!) stays well away. Oh yes! This looks amazing and so nourishing. Great post! I made this last week and it’s delicious. Thanks for a keeper. Thanks! Haven’t made it in a while and it’s that time of year again… gearing up!